If you are a harp professional, amplifying your harp is one of the many skill sets you must master. In fact, it is even more important for harpers to understand amplification than it is for most other musicians because harps have unique amplification issues and, trust us, the guy the venue hired to run the sound for your concert has no clue. You have to be the one who knows. We have some general information for you on our Amplification Basics page and we have worked hard to do the footwork (ear-work?) for you on amplification equipment. It is important that you know that an amp which sounds amazing with a guitar may not be as good for a harp. Harps have a range and harmonics which set them apart. The amps we carry have been selected from the vast array of amps out there as being reliable and quality performers for our harps. One last thing, and we can't emphasize this enough, throw away your cheap cables, the ones connecting your harp to your amplifier or your wireless system. They are eating the voice of your harp alive. Seriously, if you do nothing else to improve the amplification of your harp, buy Asterope cables or one that is labeled as HD quality. It will be the best money you ever spend as a pro. No joke. No one ever thinks about this but the cable that runs between your harp and your amplifier loses details from the voice of your harp so your harp ends up sounding less clear. Asterope Hi-Def cables are the aural equivalent of high definition computer displays in that what you hear out of your amplifier sounds just like your harp...only louder. It really is an astonishing difference. Trust us, when we were first exposed to these cables we thought, "Really, how much difference can there be?" When we heard a comparison we were floored. Asterope Hi-Def Cables produce a high quality sound like no other cable. They utilize revolutionary technology that delivers a reduction in noise and a substantial increase in clarity, harmonic and frequency response and spectral balance. These Asterope cables were named the “Product of the Year” by the musical instrument manufacturers organization for a reason - they are every bit as amazing as their price would indicate. We guarantee you will love them. The cables come in four lengths: 3’ (91.44 cm), 6’ (182.88 cm), 10’ (304.8 cm), and 15’ (457.2 cm). If you are wondering why anyone would want a 3’ cable, remember that with a wireless system the cables connecting the transmitter to the harp and the receiver to the amp are just as prone to losses as regular cables so replacing them with these high definition cables can make an important difference. Asterope Hi Def Cable plugged into a Fishman Loudbox Mini Charge Amplifier. We are using the new LR Baggs IBEAM Active System (Classical). It is a combined pick-up and pre-amp with a 1/4 inch jack connector. This pick-up is specifically voiced for nylon string instruments and has a high degree of fidelity which will bring out the dynamically rich voice of your Harpsicle® brand Harp. The pre-amp has a built in compression and auto-EQ to render a warm sound at any volume, without the need for an external EQ or compressor effects. No other pickup/preamp has this feature. The IBEAM Active system is powered by a common 9V battery. We were in a hurry, threading through the crush of the crowd at the 2018 NAMM Show (the giant trade show for musical instrument manufacturers) when, amidst the din from the nearby booths of some of the world’s biggest amplifier companies, came this warm, loud, clean voice of an acoustic guitar. We stopped. People ran into us. We “swam upstream” to get back to the booth we had just passed and there it was, the Lunchbox Junior. It was a tiny (and we mean TINY) amplifier with a freakishly loud voice! We went back to our booth and got one of our Fullsicle™ Harps. We listened again. We were completely blown away. How could anything this small and this light sound this good? Honestly, we have no idea how ZT does it but we are pleased to be the first harp company to heartily recommend the Lunchbox Junior. The best part is, the Lunchbox Junior is more than just tiny, it is light too weighing in at a mere 5 lbs (2.3 kg)! Even better, it has an optional battery pack which makes it a perfect amp for busking or any harp gig where power is not readily available. OH! And it even has enough power to run 9V output to effects pedals. We are not kidding, this is an incredible amp and a must for gigging harp pros. The ultimate desktop/recording amp - takes up no space but sounds great! For detailed specifications and more views, hover over the amp photo and click on "Quick View." A custom-made padded carrying bag for the ZT Lunchbox Junior Amplifier. 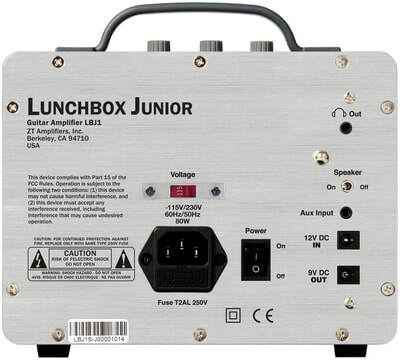 This battery pack charges the Lunchbox Junior Amplifier for two hours or perhaps a bit more. It uses eight AA batteries (not included) for easy backup/replacement. We do strongly encourage the use of rechargeable batteries. Garen using a Fishman Loudbox Mini Charge Amp, Asterope Hi Def Cable, a Grand Harpsicle® Harp and a Grand Standing Stand. Recommended for all harp models including Grand and Brilliant harps. The Fishman Loudbox Mini was another terrific discovery we made at the 2018 NAMM Show (the huge trade show for musical instrument manufacturers.) 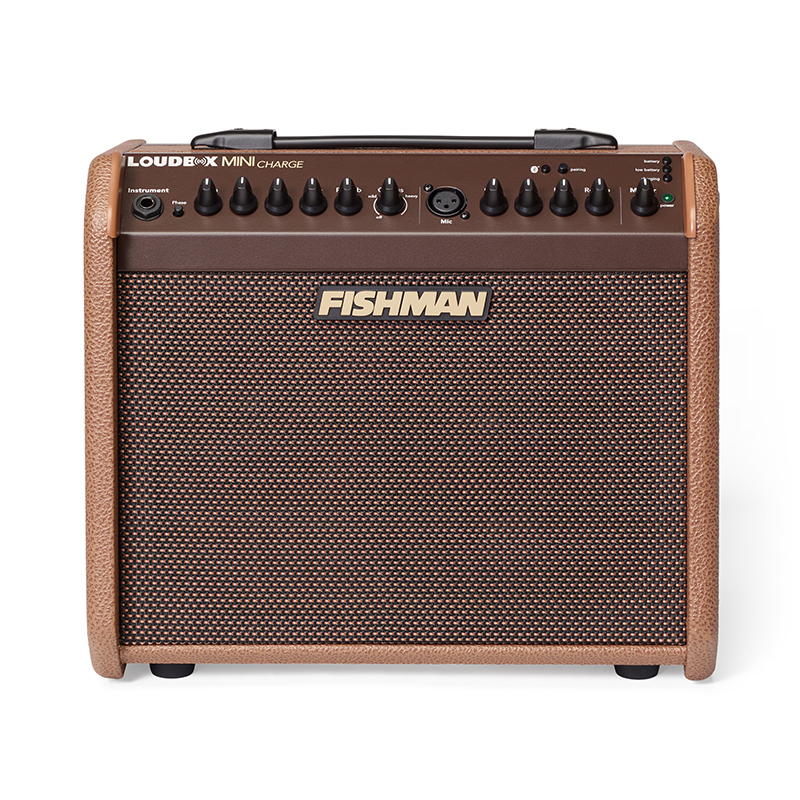 The Fishman Loudbox Mini Amplifier is a portable, rechargeable, 21.2 lb (9.6 kg) amp. The charge lasts 4 to 18 hours, depending upon volume so you are set for almost any gig anywhere. The harp voice comes across rich, clean and warm through the full range of the instrument. The Loudbox Mini Charge rechargeable battery-powered amplifier does more than just amplify your harp. This amp has XLR-input so that you can accompany your harp with your own voice and the addition of Bluetooth® wireless connectivity, you can now easily add backing tracks or other accompaniment to your performances, jams, or wherever your Harpsicle® Harp takes you. 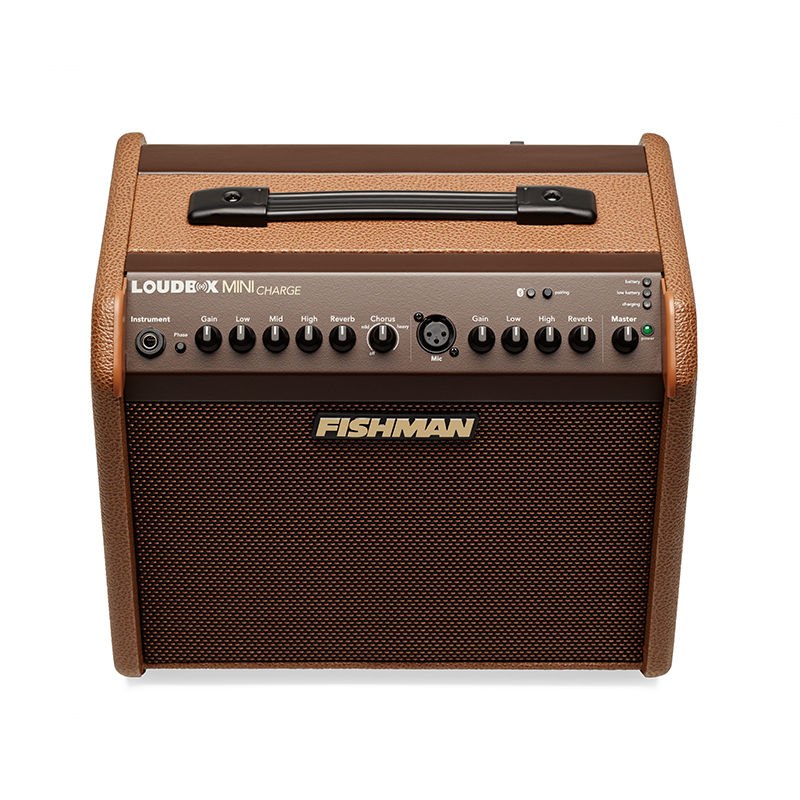 Fishman is a long-established, well-respected name in the music industry and the Loudbox Mini is an exciting addition to the Fishman tradition. If you only gig occasionally and you don’t go far from home then having a really nice, well-made bag for your amp isn’t essential, for everyone else it is a must. You can pack & protect your Loudbox Mini Charge, wall charger, car charger and cables with style and convenience. This bag has a shoulder strap, two accessory pouches, and rugged feet. The Fishman SA330x Performance Amplifier System is a true professional’s amplifier. We have used this amp in our show booths because we are completely confident in the quality of the tone it produces. Everyone who goes on the road for Rees can attest that the SA330x helps our harps sound like our harps…only louder which is, after all, the whole point! The SA330x features two inputs on the front with individual 3-band EQ, one for your harp and the other for vocals or for another instrument. The back of the amp has an additional complement of inputs and outputs to make set-up a breeze. A tripod stand and a padded carrying sleeve is included and a deluxe bag with wheels is available as an option. Unlike many other similar-looking systems, the SA330x is built around a uniquely configured 2-way speaker system that delivers all the sweetness and definition of a great studio monitor. Just as importantly, the Fishman Modified Line Array fills the room with sound that can be heard cleanly and clearly in the back row, without “blowing away” your audience in the front. This amp is ready for the road and is ruggedly built and with plenty of power. Unfortunately, we can only ship this item within the United States. Wow, do we LOVE this bag!!! We have been using ours for years and it has seen truly seen a lot of miles. It is well-padded, rugged and has wheels on one end so you can tow your amp behind you while you carry your harp, in its bag, on your other shoulder. We know this from (repeated) personal experience. In addition to holding your amp and the amp stand there is also plenty of room and several pockets to organize all the other cables you need for your gig. The carrying bag that comes with your SA330x is fine for light use but if you play your harp for a living, this deluxe bag is a necessity and we know you will appreciate yours just as much as we do ours. WiC Wireless System receiver hooked-up to Fishman Loudbox Mini Charge Amplifier. You really can cut the cable and walk freely while playing your amplified Harpsicle® Harp. WiC™ is a high fidelity Wireless instrument Connection with sound quality that will make you forget the cable. We have tried a LOT of wireless systems but the WIC™ system truly is exceptional. Just plug the WiC™ transmitter with the blue stripe into your instrument and plug the longer cable from the receiver with the red stripe to your amplifier, pedal, or mixing board. Setting you free is just that easy!